Go beyond printing and bring new capabilities to your team with the MB2236adw's standard scanning, copying and faxing. Single-sided scanning captures your documents in monochrome at up to 24* pages per minute. Average continuous black cartridge yield is standard pages as listed. Declared yield value in accordance with ISO/IEC 19752. Actual yield will vary considerably based upon many factors. 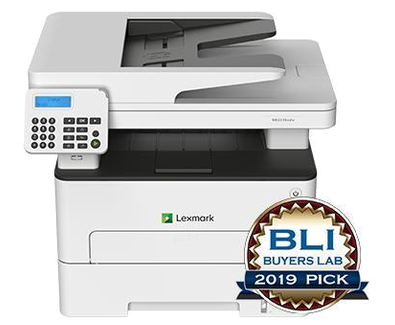 See www.Lexmark.com/yields for more info. 13.9 x 16.4 x 14.2 in. 18.3 x 17.1 x 21.7 in.